Zinc faucets, aluminum gate valves, iron gate valve, polyethylene spigots, barrel faucets, drum faucets, and drum valves. 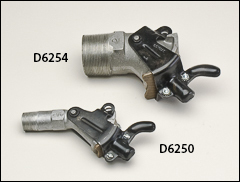 Faucets shown below are for use with non-flammable liquids. Please see our Faucets for flammables page for other faucets. Additional drum equipment is available on our Cradles, dolly, lifters , Drum and pail heaters , Drum deheaders, funnels , and Drum pumps pages. Zinc die cast alloy, viton gasket, self closing design, 3/4" NPT threads. Can be padlocked in closed position. Rigid style, not a swivel style faucet. No internal threads for using a faucet extension. For non-flammable liquids. D6240: no flame arrestor. FM approved for viscous liquids. D6245: includes flame arrestor. FM approved for non-viscous liquids. Lightweight, durable aluminum gate valves only for use with non-flammable viscous materials stored in or dispensed from non-pressurized containers at ambient room temperature. Improved corrosion resistance for certain fluids. The sturdy 2" handle is enamel finished. Excellent for dispensing heavy oils, light grease, and other non-flammable viscous fluids. 45-60 degree discharge for optimum flow control. Requires half turn to open or close. 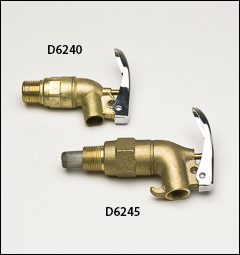 3/4" faucet for use with non-flammable, non-corrosive thin liquids, not suitable for heavy oils. 0.10 lbs. 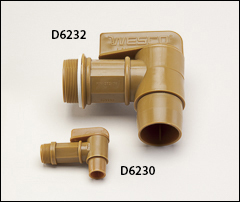 2" NPT drum faucet produced from FDA approved material. Includes 3 EPDM sealing gaskets: thin, medium, thick. Good for viscous non-corrosive fluids. 0.83 lbs.